Our budget is solid. Future expenditures include one more newsletter this year, Halloween party, Block party. 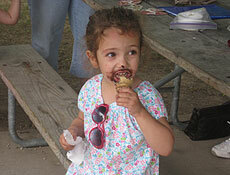 We had a great turnout at the ice cream social and plan to do this next year. Lots of people signed up to renew their membership as well as join for the first time. We are currently searching for vendors for next year to donate food to help defray the cost. This was extensively advertised with many participants and shoppers. It was held on August 10 and 11 with 31 sites participating – a huge success. Ulrike suggested that we designate the 2ndSaturday of August as the garage sale date because that is a national garage sale day. People can then choose to include Fridays. Perhaps part of the proceeds can be donated to schools, libraries or parks. She wants to explore if St. Vincent de Paul could pick up remaining items as well. Jesse said that some trees will be planted in the area where the emerald ash trees were removed due to emerald ash borer disease but was wondering just how many. He also looked at a couple of emerald ash trees to adopt. He has a permit issue to treat the one tree by the playground for emerald ash borer. Each tree and treatment costs $240.00. Ken felt that the neighborhood association should pay for the cost of this tree. A motion to have SVCA pay the full cost for the treatment of this tree passed unanimously. Sue was wondering if we still need four meetings each year. She does feel that we need the February meeting. Liz, Ulrike and Anne and Ken like four meetings because we usually have enough projects. More people may be disinclined to come to meetings too if there are less. Ken suggested that when we have an outside speaker, we should invite another neighborhood association. Sue is open to suggestions for speakers at our meetings as well. Bev suggested that we reach out to our new neighbors so that they could come to one of the meetings. Quarterly meetings will stay in the bylaws. We are looking at keeping the terms open to more than two, two year terms for officers. Finally, there are no standing committees. Committees can be established at any time. We will post these bylaws on the website and revisit these at our November meeting and vote on them at the February meeting. The issue is: Can SVCA help support this event financially? Ken felt perhaps we could support this as it did start as a Grass Roots effort. Ken made a motion to support it by donating $100.00 without promotion and revisit it next year to see where we are. The motion was approved. The 7thannual Block Party will be Saturday, September 29 at the island of North Hillside terrace from 11:30 a.m. to 2:30 p.m. There will be music, party games and food. Food and beverage options are being explored to keep the cost down for all who attend. Alice Yuroff kindly offered to organize this party and parade again. It will be Sunday, October 28 at Sunset Park at 2:00. She requested an increase in the budget. The budget will be increased to $250.00. We have the residential parking presentation on Wednesday, August 29, the Midvale accident discussion is still being worked on. We’re working on location issues and Traffic Engineering schedules (they are down several staffers due to paternity leave and the retirement of the director). I am also waiting to hear from the new midtown lieutenants regarding the uptick in crime in District 11. We are hoping to come up with some trends or ways that we can be proactive about prevention. In the meantime, the best advice is to make sure that everyone locks their car doors, their house doors, and their garage doors. 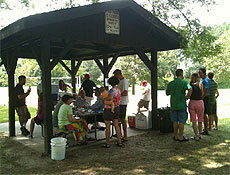 The party for our summer ranger is set for Wednesday, September 5 at 5:00 at the picnic area across from the Overlook. All are welcome for drinks and treats. 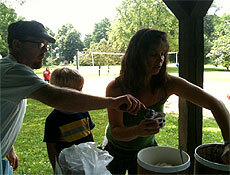 Our Hoyt Park workdays are the third Saturday of the month at 10:00 through November. Please refer to the FOHP Website for the specific activity for each Saturday. Our July workday included planting quite a variety of milkweed plants by the Overlook and Ready Prairie. Consider joining Friends of Hoyt Park. Your financial support helps us restore and maintain the natural plant communities. Discussion came up to have FOHP have a pamphlet available to pass out at our Ice Cream Social at Lucia Crest to generate interest in joining and learning about it. Discussion concerning the garage expansion at 329 East Sunset Court will take place at our November meeting.